See Thru Gas Log set that comes with a Real Fyre G9 See Thru Ventless Burner. Made for See Thru or Peninsula Fireplaces Only. The Real Fyre Golden Oak Designer Gas Logs by Peterson are one of the most popular models of Peterson Real Fyre gas logs because of their combination of beauty and function. The logs themselves are made of superior refractory ceramics, expanded shales, and aggregates reinforced by steel rods that provide maximum integrity and prevent breakage. 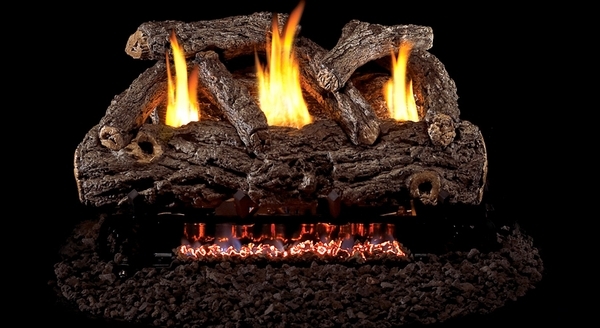 The exterior of the gas logs feature handpainted details that create a uniquely realistic look. Adding to the realism are the holes in the top of the gas logs that allow flames to come through, completely mimicking the look of a natural fire. Real Fyre Golden Oak Gas Logs by Peterson provide the perfect mix of authentic fire-like appearance, rugged durability, and maximum performance for your home and fireplace. This is a See Thru Gas Log set that comes with a Real Fyre G9 See Thru Ventless Burner. See thru gas logs will have a special burner that causes the flame to come from the front, back, and middle of the logs. The logs and grate are also the same width in both front and back. This burner and log set is made for See Thru or Peninsula Fireplaces Only. This gas log set comes with a On/Off Remote Ready Pilot System. The pilot will stay lit at all times. The on/off remote ready pilot system allows you to control your system using a remote control, wall switch, or the manual knob on the burner system. This system does not have variable flame height control. The flame will always be the same height. Basic On/Off Remote Control (Real Fyre RR1a) - This remote will turn the unit on and off. Deluxe On/Off Remote Control (Real Fyre RR2a) - This remote will turn the unit on and off. The RR2a also has a room temperature feature and thermostatic control. Basic On/Off Wall Switch (Real Fyre WS-1) - This is a standard wall switch used to turn the unit on and off instead of a remote control. Deluxe On/Off Wall Switch (Real Fyre WS-2) - This is a wall switch used to turn the unit on and off instead of using a remote control. This Deluxe wall switch also has a timer. * The fireplace's Middle Width must be at least 28 Inches and the Depth must be at least 18 Inches for this gas log set to fit. You can calculate the middle width of your firebox by measuring the width (left to right) approximately half way back in the firebox. If you have any questions, please contact our customer service department and we will be happy to assist you in finding the perfect size gas log set. The logs are very realistic looking and exactly what we needed for our fireplace. We also have a fireplace screen and recommend the remote control for ease of turning the unit on/off. Pros-Larger more realistic looking flame than expected. We love the simple on/off remote. -Did not notice an odor mentioned by some with initial burn. -Arrived quickly, packaged well. -Customer service answered questions timely. Cons-The state of WI does not allow non vented inserts. I didn't check this before ordering. In order to have this unit installed by a professional, it could only be set up as a "vented appliance" with a damper clamp placed. Without glass doors, the heat goes up the chimney. -Professional set up $100-$125 for updating gas line fitting, adding shut off valve, set up & checking for gas leaks. I am very pleased with how quickly my logs came. 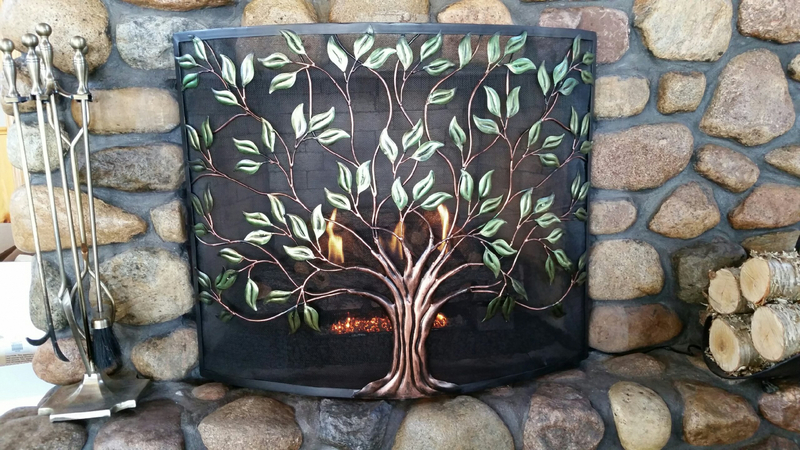 They were easy to install and look remarkably realistic for gas logs. They are very warm and make our home nice and cozy! love Love LOVE my new gas logs!! Customer service was so helpful when I called in for assistance. He helped me pick the right set for my house. I ordered them and had them within 5 days! I am very satisfied with the eFireplaceStore! I received the order in a timely fashion. The order was packaged very well. The logs came with everything I needed to make the gas hookup a breeze. I removed previous logs and from that point I had the new logs installed within 35 to 40 minute. The remote not only turns the logs off and on, , but has an adjustable flame height feature that also acts as the thermostat when you set it for that mode. Easy to follow instructions. I would order these logs again.. You get what you pay for. ProsWell made, logs are heavy duty and will stay in place. Good Simple remote. Good install instructions. Works as stated and looks great. Also puts off some nice heat to warm up the room on a chilly morning. We are very happy with our purchase and would recommend this product to anyone looking for this style of fire log. I purchased the Golden Oak ventless set to replace a 10 year old vented set from a different manufacturer that was having problems staying lit. I was also interested in a ventless version to improve the efficiency. Installation went very well with no problems at all. ProsThe Golden Oak set looks very nice - the small burning embers in front really add to the ambiance! Other pluses include the amount of heat it puts out (a lot!) and the ability to adjust the flame height via remote. The logs themselves are also quite heavy and seem very durable. ConsThe only real negative is that when you activate the remote the controller does make a noise - a fairly loud whine of the motor as well as a clicking of the pilot. We've also burned the log for about 6 hours with the vent open to exhaust odors and today was the first day we tried leaving the vent closed - there is definitely a gas odor that I'm hoping mostly goes away soon (although I recognize there will probably always be a bit of it with the closed vent). Excellent product. Works as described. Easy install and setup. 24" ventless Golden Oak Fyre log with safety pilot. 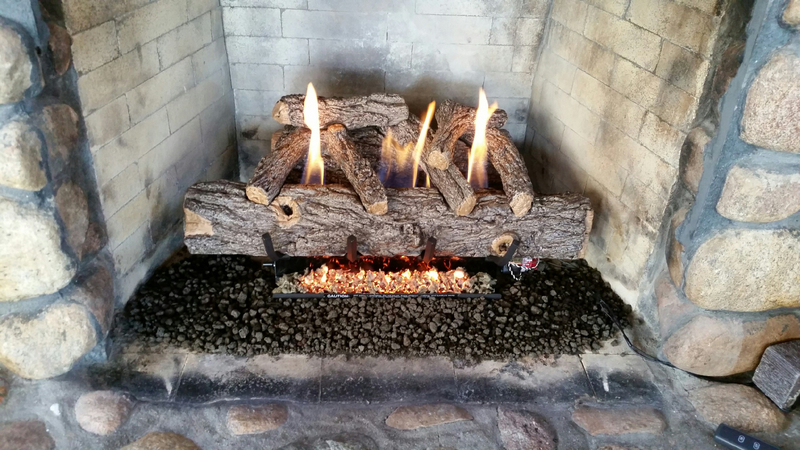 Fire logs were easy to install and look natural with a great flame pattern. It is a perfect addition to my dining room- it is beautiful, heats a big room easily, and is cost-effective. The batteries in the remote were dead when it arrived, and I was sent two new ones immediately. Good service, good product. I'm pleased. This is my second set from this company- one fireplace to go- and I will purchase again from them! They look real and are easy to handle. Great company to deal with. ProsThey look real and easy to stack so they don't fall on each other. I just love this fireplace because of the remote pilot kit that comes with it. I can set the room temperature and the fire goes off when the temperature is met, and then goes on again when the temperature goes below what I set it at. It is a little tricky to connect it, you need to contact the company for detailed instructions that have not been included in the brochure. Anyway, it is well worth the extra trouble. We are very happy with the unit. We burn it in a masonry fireplace that is completely closed to the outside and have had no problem with odors. It is amazing how much heat is generated and we have the variable flame turned way down. Great unit. We use a heat pump, so the energy bill can get expensive. This allowed us to turn it off completely at night!